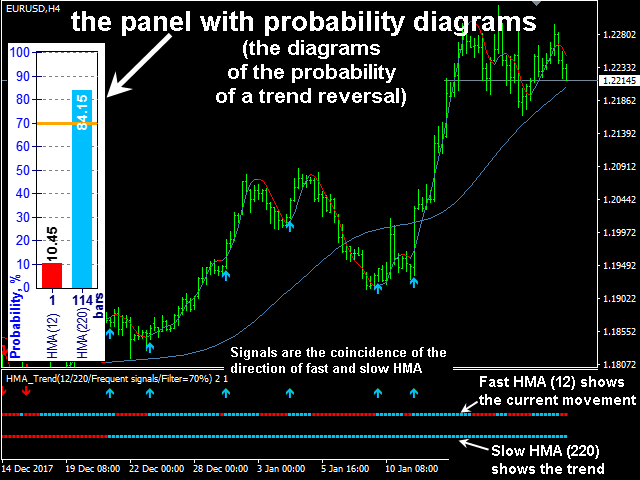 Improved version of the free HMA Trend indicator (for MetaTrader 4) with new trading capabilities. 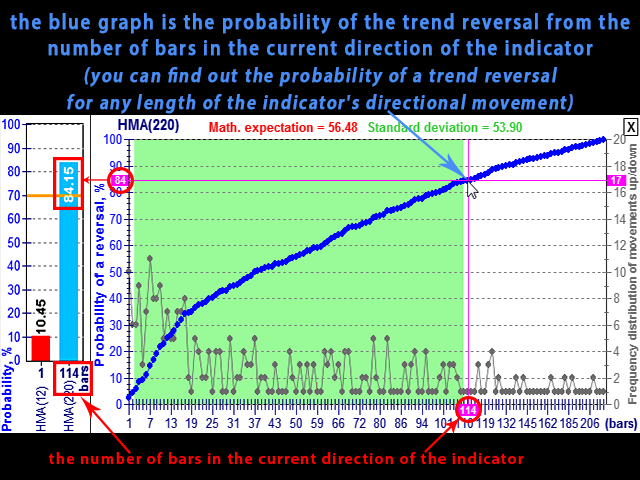 HMA Trend is a trend indicator based on the Hull Moving Average (HMA) with two periods. HMA with a slow period identifies the trend, while HMA with a fast period determines the short-term movements and signals in the trend direction. Ability to predict the probability of a trend reversal using analysis of history data. Plotting statistical charts for analyzing the probability of a reversal. 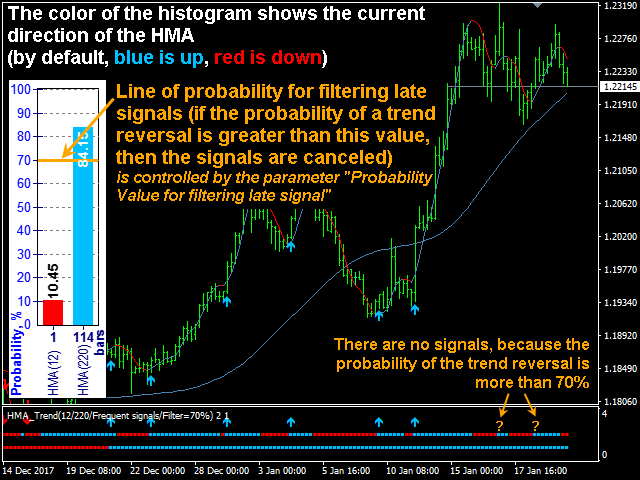 Automatic filtering of signals with a high probability of trend reversal. Ability to generate preliminary signals on the current open bar (can be canceled). The HMA indicator changes color when its movement direction changes. This feature can be used to try to predict the change in the direction of the indicator, and, therefore, to predict the trend reversal. 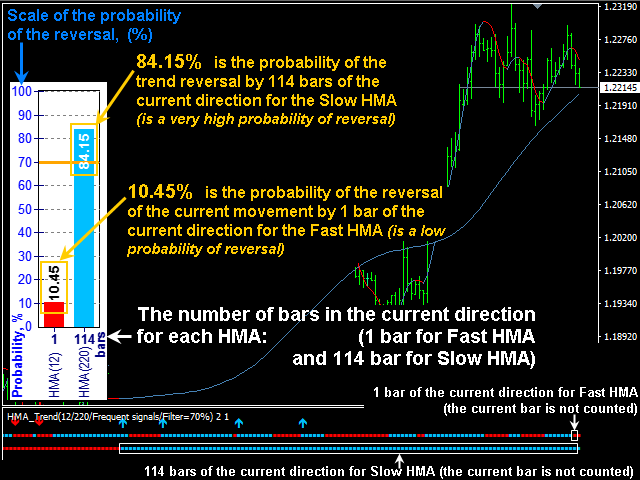 The probability of a trend reversal is the probability of switching the direction of the slow HMA. Expected value (in the context of the indicator use) is the number of the HMA indicator bars in the same direction in history, where the HMA indicator had reversed on average. 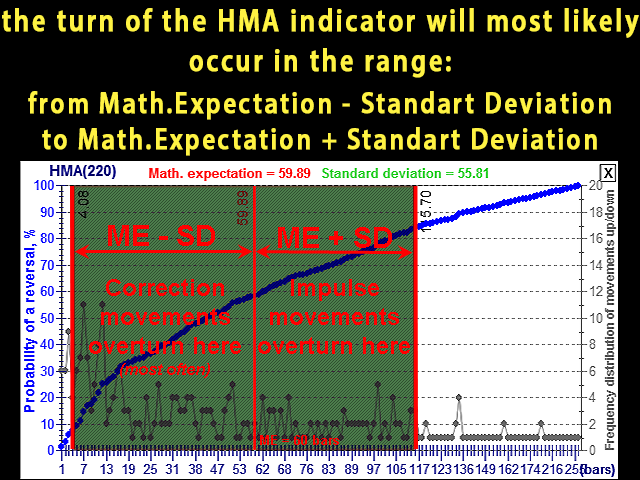 Standard deviation (in the context of the indicator use) - the HMA indicator is most likely to reverse in the range of bars from ME-SD to ME+SD (where ME is the expected value, SD is the standard deviation). In practice, impulse movements are noted to occur most often in the range of ME+SD bars, and the retracement movements take place within the range of ME-SD bars. If you know that the slow HMA is probable to change the movement direction, do not open a deal, since the old trend has already been exhausted, and the probability of reversal or correction is high. If you see a possibility of the fast HMA switching in the near future, open a deal at the end of the retracement movement and close a profitable deal at the end of the impulse movement. HMA settings - parameters of the Hull indicators. Fast HMA period - fast HMA period. Slow HMA period - slow HMA period. HMA averaging method - smoothing method. 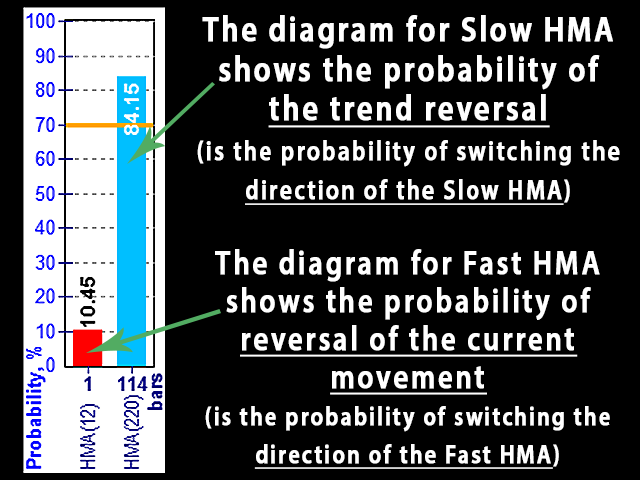 Frequent signals (by switching Fast HMA) - frequent signals by switching of the fast HMA in the direction of the slow HMA. Rare signals (by switching Slow HMA)) - rare signals by switching of the slow HMA. Arrows of signals in main window - draw signal arrows in the main window. Rendering depth of signals (=0 - the whole history) - the number of bars to draw the signals (0 - all history). the Probability Value for filtering late signals (Freq.signals) - the probability value, above which the late signals are filtered out (only for the frequent signals). Color of UP-trend signal - color of the Up signal. Color of DOWN-trend signal - color of the Down signal. Messages/Sounds - text and sound settings. ON/OFF - Sound when the signal - enable sound signals. ON/OFF - Alert - enable alerts in the terminal. ON/OFF - Mail - enable sending emails. ON/OFF - Push - enable sending push notifications to mobile devices. Sound file on the closed bar - the final signal - audio file name for the final signal (on a closed bar). Sound file on the current bar - the possible signal - audio file name for a preliminary signal (on the current bar). Enable the possible signal on the current bar - enable a preliminary signal on the current bar. 1. Fixed a bug that caused the 'out of range' error with a very short history. 2. 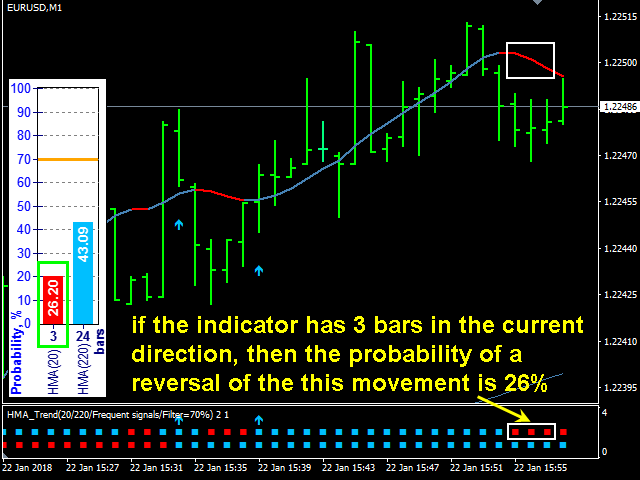 Sometimes the indicator left the panel with probabilities ("Probably_panel") after it was closed, if the indicator was not visualized on the current TF or the template with the indicator is loaded.